Faced with an opportunity to earn some extra money, Nanako Usami agrees to aid in the endorsement of a new pool, only to find that the job requires more than she was aware of. Having become local idols, or "Locodol", Nanako, alongside her new friend and partner, Yukari Kohinata review a restaurant and get together to talk about naming their "unit". With their name solidified as Nagarekawa Girls, Nanako and Yukari are introduced to a mascot, whose actual identity is big surprise! The Nagarekawa Girls get a new manager who seems really on top of everything. Is she too good to be true? Nanako begins to wonder about the group's future and sets a huge goal for them - hitting the international stage! Nanako and Yukari do their best to give Yui their support as she competes in the mascot athletics festival. Will she get out of it without hurting herself? With the possibility for the television airing of the festival to boost their popularity, the girls can't wait to see it. The only problem is that they keep missing it! Distraught with Mirai's discomfort around her, Nanako tries to get closer to her with karaoke! Nanako realizes that real friendship comes more naturally. Nanako unwittingly runs into Yukari's grandfather, the town's previous mayor, and she starts to wonder about why Yukari decided to become an idol. After being told about an upcoming Locodol festival, the Nagarekawa girls all pitch in to write a song, craft new choreography, and begin practicing! After working so hard, the girls discover a huge dilemma; the Locodol festival and the local Nagarekawa festival are on the same day! 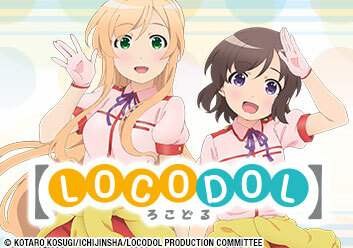 The girls head to Nagoya to perform at the Locodol competition, but the performances begin falling behind schedule! Will they make it in time to perform in their beloved town?